Can we call it a Raspevolution yet? The UK (the Sony-owned Pencoed factory in South Wales, to be precise), has baked its one millionth Raspberry Pi. Announcing the figure in a blog post on its company website, the Raspberry Pi Foundation says that a total of 1.75 million of the diminutive computers have been built to date. Three quarters of a million were made in China, where the first Raspberry Pis were made back in 2011 before production was moved to the UK in September 2012. And if you're wondering what's happened to the millionth Raspberry Pi made in the UK, it's been housed inside a gold-plated case and locked away in the Raspberry Pi Foundation's headquarters. Hands off, in other words. 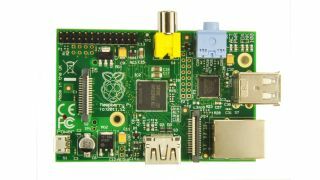 The Raspberry Pi, which costs between £25 and £32, is a highly customisable motherboard that can function as a fully-fledged PC. It's primarily used to help teach coding in schools, but the device has also been used by enthusiasts for anything from watching TV to browsing the web, running ZX Spectrum emulators and even controlling robots. But are there any business benefits when it comes to the Raspberry Pi?